I LOVE Vintage!! From elegant clothing, jeweled hand-bags, stunning jewelry... so much so that my wedding ring I actually drew, ended up carving and having a one-of-a-kind piece. 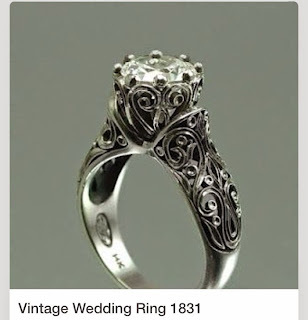 So when this Fashion Friday inspiration came from a Vintage Wedding Ring of 1831 - I couldn't resist! 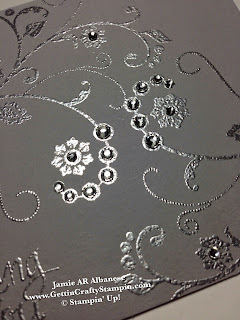 Here is an elegant, jeweled and metallic card that takes the essence of this ring into a hand-stamped card. 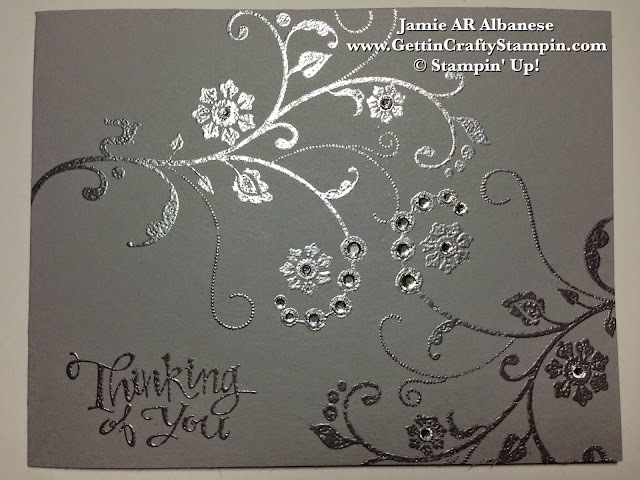 Join Me and see how fun and easy it is to create a pretty hand-stamped card. I LOVE the scrolls and elegance of this ring - easily translated to a pretty, feminine, elegant and sparkling card! Cut your Smoky Slate card stock and score at 5-1/2" for a long and lean card. Prepare the surface, anytime you emboss, with the Embossing Buddy. This gives a primed and ready surface to take any Versa Mark stamped image. Stamp this Flowering Flourishes scrolled flower image on the card front two from two different sides to fill the page. 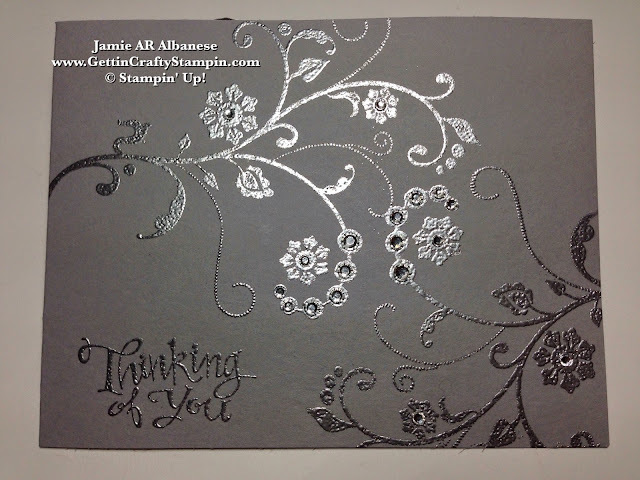 Stamp the 'Thinking of You' from the Sassy Salutations stamp set in a corner with the Versa Mark ink pad. 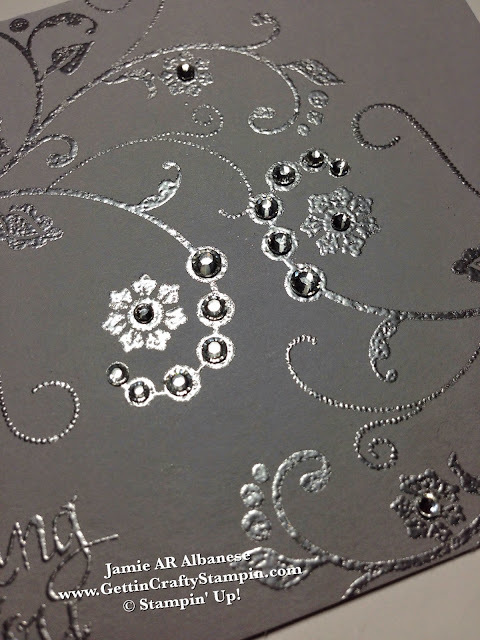 Liberally cover with the Silver Embossing Powder - the prepping of the surface using the Embossing Buddy will allow for it to stick only to the stamped image. Shake off excess and heat set using the Heat Tool. 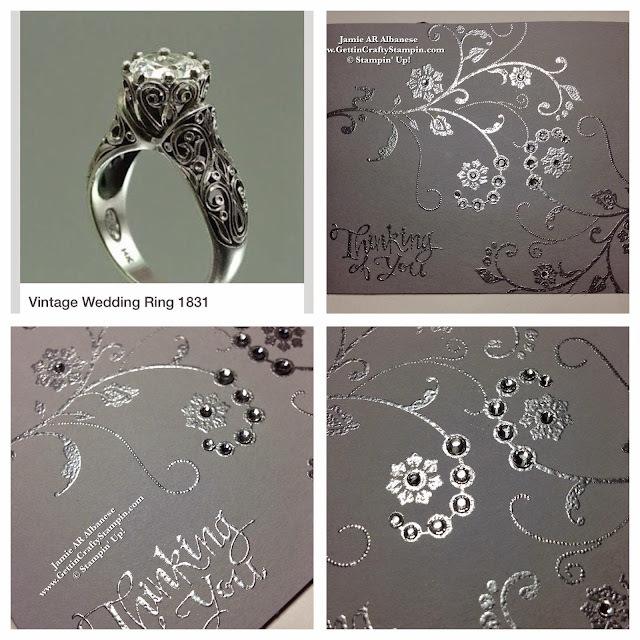 You have a stunning silver on grey image that is sure to WOW. 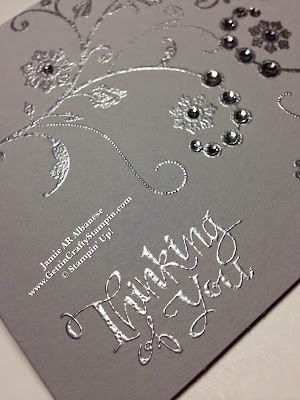 Accent the flowers and branches on this card with our adhesive backed Rhinestone Jewels. They will add an additional aspect of pretty elegance to your project while being super easy to use! Do you ever feel that crush of the Holidays, like it's hard to catch your breath, do it all and still capture some memories (I do, sigh)? Feel LESS Stressed during the holidays when you think ahead! Get a JUMP Start on your Holiday Card making... start NOW! Consider a fun Private Class (with me) and have your family and friends join you! I hope that you enjoyed this Christmas in July hand-stamped card. Don't Miss OUT on Upcoming Classes.. RSVP ASAP. Delivering a hand-stamped card is the perfect way to show that you care, it's just that much more special! Embrace the beauty of Vintage items, from Jewelry to clothing. This fun Fashion Friday isn't limited to clothing, some of my favorite fashion is accessories!! This 1831 wedding ring is pretty old but delivers new smiles. No matter where you get your inspiration, you can deliver smiles that will live on and on when you send a hand-stamped card. Show someone you care and are thinking of them with a hand-crafted card!